Over the last couple of years, I've noticed chestnuts falling in the parking lot of our local library in the fall. Last year I picked some up, and didn't do much with them. This last week, I decided to go see if there were any on the ground, and we happened to go on a day when they were falling! That made things a little exciting, particularly when one fell on my head. We could hear them bouncing off cars parked under the trees. 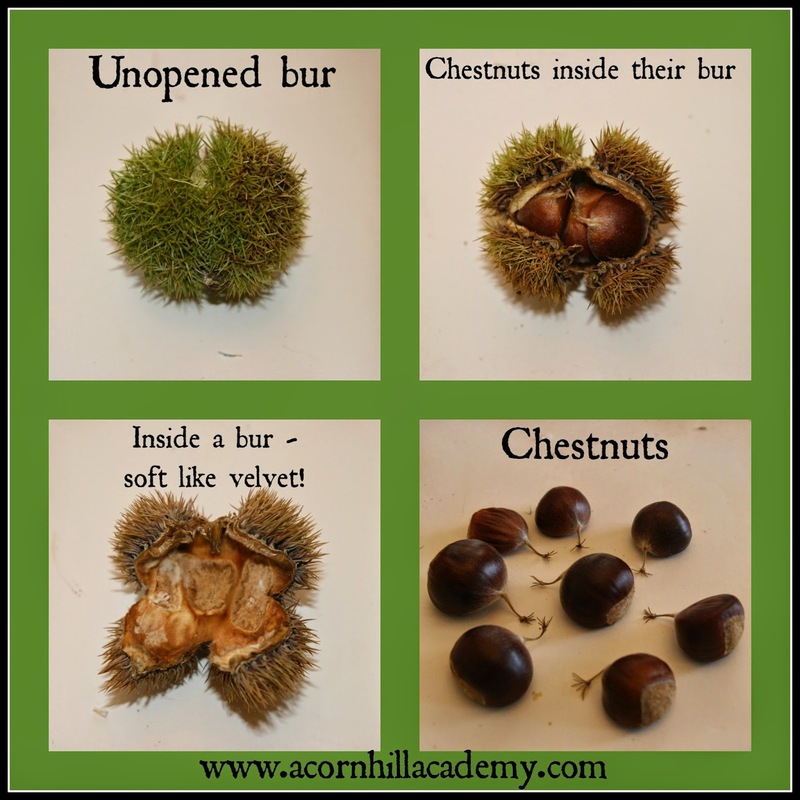 Chestnuts grow inside VERY prickly balls, and it feels like picking up a pincushion with the pins wrong side out when you collect them! Thankfully, we'd just been to the post office and my son had gotten a small box, so we had something to hold our treasures. And, although I thought the tree with younger bark was a younger tree, upon further inspection, it seems that it's a pretty old tree that's lost its main trunk. It had three other trunks growing up from it, all about the same size - I'd guess about 12" diameter. One thing I did not find in my car was a tape measure, so I couldn't check. I did find these nifty instructions for estimating the age of a tree that hasn't been cut down, though, in case you'd like to try it. In researching chestnut trees, I learned that the American chestnut tree fell victim to a fungus blight in the early 1900's, so while there are still trees growing up from old stumps and young trees around, the old trees are gone. The blight destroyed 25% of the trees in Appalachia, according to what I read, which had a tremendous negative ecological and economical impact on the area. If you want to grow chestnut trees, you need to be aware that they will not live to be old trees. You should also be aware that you have to REALLY want to grow chestnuts, because those burs are going to make a mess in your yard and they are not fun to handle. I had no idea the American chestnut tree (Castanea dentata) was all but gone, and had fun researching and learning about different kinds of chestnut trees. After looking at the information on this page, I have identified the ones I found as Chinese chestnuts (Castanea mollissima). There is work being done to bring back the American chestnut tree. 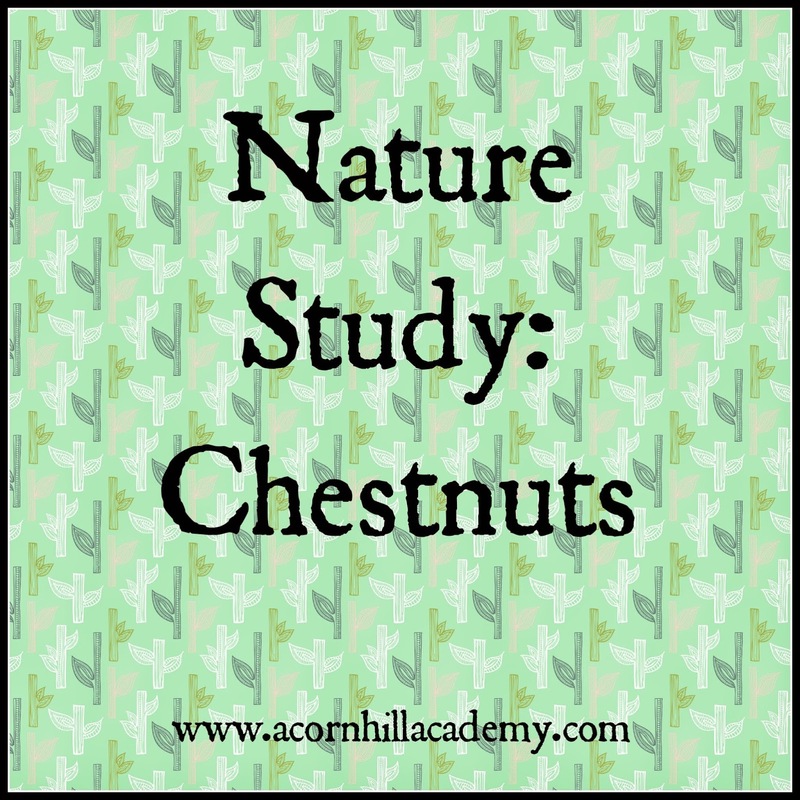 The Handbook of Nature Study (aff link) has a great study of chestnut trees. It was obviously written before the chestnut tree population was decimated, but the information is still valuable, and you could apply the study questions to Chinese chestnut trees as well. Click here to to download the Chestnut Teacher's Story and Lesson (PDF file). If you're interested in learning more about chestnut trees, check out the American Chestnut Foundation's website. There is also good information here. You can download this children's book, The Legend of the American Chestnut Tree (link to PDF). And, there is a cute site for kids called Charlie Chestnut. 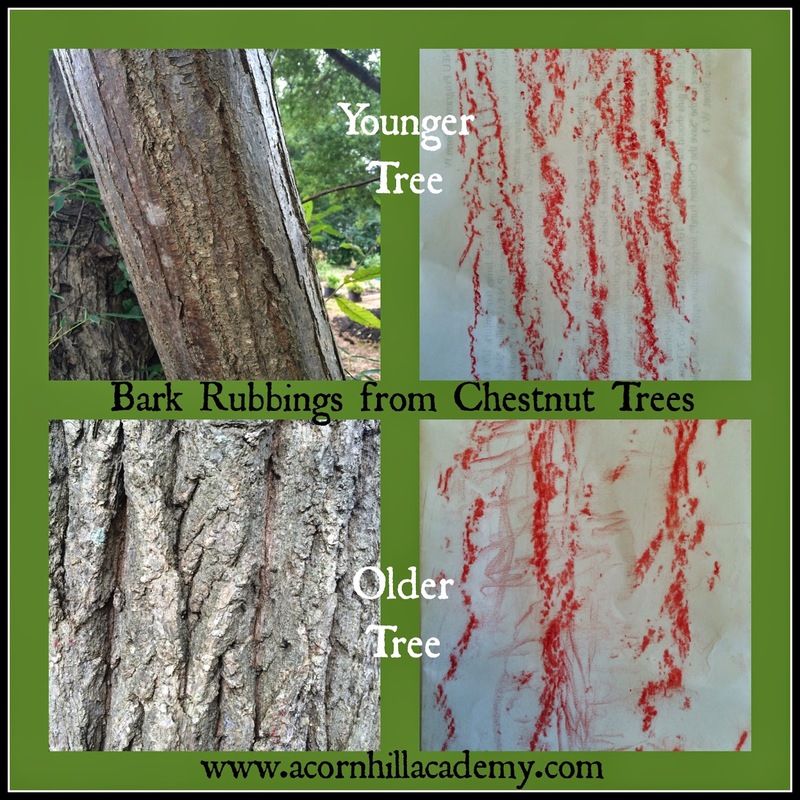 I've recently become a contributor at the Year Round Homeschooling blog, and today I shared a post over there about beginning a year-round study of trees. There's a free notebooking page there for you, as well as information on autumn tree study taken from the Handbook of Nature Study.